Born in Washington, DC, a native of Houston, TX, and a 1998 graduate of Taylor High School, Staff Sergeant Edgar Heredia enlisted in the Marine Corps in July of 1998. He began his career as a Machine Gunner and then attended the Basic Security Guard Course and was assigned to the Security Force Company, Naval Submarine Base, Kings Bay, GA. SSgt. 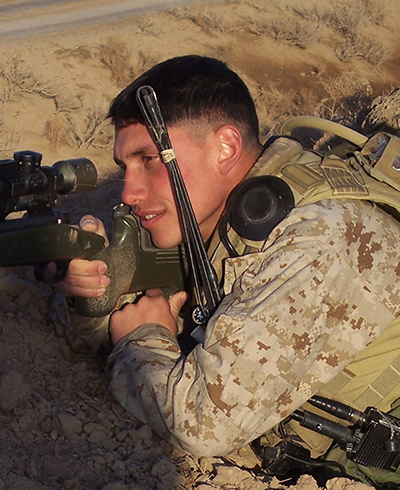 Heredia become a Reconnaissance Marine in 2002 and was assigned to 2nd Marine Reconnaissance Battalion, Camp Lejeune, and joined MARSOC in late 2006. SSgt. Heredia was known for his fierce loyalty, dedication and devotion to his family, friends and fellow Marines. He was also dedicated to professional development, attending military courses including Designated Marksman, Sergeants Course, Scout Sniper School, Urban Sniper and Emergency Medical Technician. On June 26, 2008, SSgt. Heredia was killed while supporting combat operations with 2nd MSOB in the Farah Province of Afghanistan. SSgt. Heredia’s personal decorations include a Purple Heart, Navy-Marine Corps Commendation Medal, Navy-Marine Corps Achievement Medal, two Combat Action Ribbons, and three Good Conduct Medals.